In our continued countdown to Organic & Biomolecular Chemistry‘s 10th anniversary issue we have had a look back at some of the art work that has appeared on our covers through the years. Below are the front covers of issue 1 and the work that featured on them for each year since the inception of OBC. What’s your favourite? These stylish old school covers (right) were originally seen in 2003 & 2004 on volumes 1 & 2 respectively. Craig D. Sergeant et al. Stuart J. Conway et al. Nathan B. Bennett et al. Do you have a favourite cover from our 10 years? Why not share it with us by leaving a comment below. Interested in having your work featured on a cover? Submit your work to us and show us your artwork. Countdown to OBC’s 10th anniversary continues with tin and aluminium! Continuing our countdown to OBC’s 10th anniversary issue, we’ve collected together 10 tin and aluminium related articles published in the journal. Why? An old tradition in the UK is to give gifts of made of symbolic materials on significant wedding anniversaries, and the metals associated with a 10th wedding anniversary are tin and aluminium. Now, we don’t have any trinkets for you, but why not take a look at some of these interesting tin and aluminium-themed articles! Interested in joining in with a Perspective article for OBC? Why not get in contact – we’d love to hear your ideas. Want to write a new emerging area that you think is going to be big in the future? Why not get in contact – we’d love to hear your ideas. 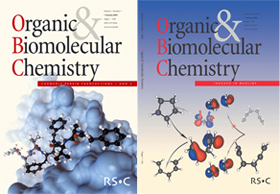 As you know, we are celebrating the journal’s 10th Anniversary, and counting down the Top 10 most cited Organic & Biomolecular Chemistry research works from our different formats, according to ISI*. This week, find out which are our most cited ever Full Papers. In addition all of these articles will be FREE for you to read until the end of next week. Have you missed the Top 10 cited OBC communications? Find them in our earlier post here. 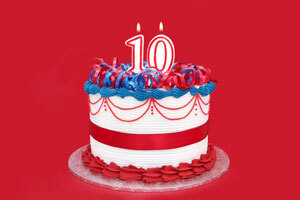 We can’t quite believe it but this year Organic & Biomolecular Chemistry is going to be 10 years old! To celebrate this we will be publishing an issue later this year that features some of the best work by chemists from across the broad scope of the journal, many of whom have served on our Editorial or Advisory Boards over the years. Leading up to the issue we’ll be bringing you some of our ‘Top 10s’ from the journal…watch this space!